Kristin Kruger, a teacher at the University of Illinois Springfield Cox Children’s Center, has been awarded the Terri Lynne Lokoff/Children’s TYLENOL National Child Care Teacher Award. The award acknowledges the critical role of child care teachers in providing quality early care and education. Child care teachers from all 50 states, the District of Columbia and U.S. Military bases around the world were invited to apply. Fifty teachers were selected for their commitment and dedication to the children they serve. As part of the application process, Kruger designed a classroom enhancement project for the children she teaches illustrating the educational, social, and emotional benefits of the project. A committee of early childhood educators and specialists reviewed the applications and selected the winners. Kruger will receive $500 for her personal use and $500 to implement her classroom enhancement project. She’ll also receive an all expense trip to Pennsylvania for the award ceremony where they will announce the grand winner. Kruger plans to use the funding to enhance the educational experiences for all students by introducing culturally diverse materials in the classroom. 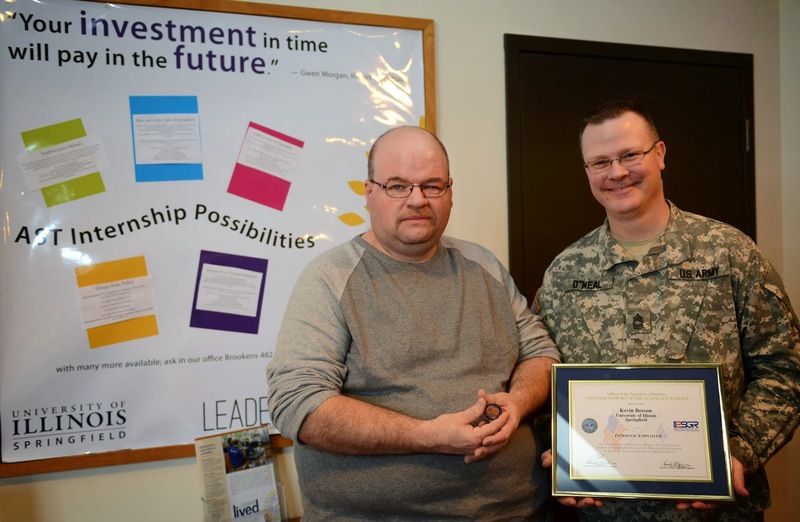 Kevin Beeson, visiting clinical professor in the Internship and Prior Learning Program at the University of Illinois Springfield, was honored on Jan. 14, 2014 for his efforts in starting two online classes for active military and veterans. The Patriot Award from the U.S. Department of Defense and Employer Support of the Guard and Reserve (ESGR) was presented to Beeson by members of the Illinois Army National Guard, including Master Sgt. Anthony O’Neal, who nominated him for the award. O’Neal partnered with Beeson to start the online classes, which give service members the opportunity to gain credit for prior learning based on their experience. As part of the classes, students share their military experiences through an online discussion board, journal and write a portfolio about their service. One class is offered exclusively to combat veterans, while the other is open to any active duty service member or veteran enrolled in classes at UIS. Students may earn up to 12 credit hours for their participation. “I’m honored to get the award, but it still goes back to our men and women in the service. That’s what this class is about and that’s what it’s for,” said Beeson. Service members and veterans may apply for admission to UIS by calling 217/206-4847 or by visiting www.uis.edu/admissions. 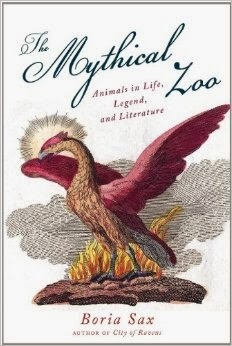 Boria Sax, adjunct instructor of philosophy at the University of Illinois Springfield has published a new book entitled Mythical Zoo: Animals in Life, Legend, and Literature. From Aesop's Fables to Mockingjay, animals have always played a pivotal role in human culture. Even today, animals wield symbolic powers as varied as the cultures that embrace them. Sacred cows, wily serpents, fearsome lions, elegant swans, busy bees, and sly foxes--all are caricatures of the creatures themselves, yet they reflect not only how different cultures see the natural world around them but also how such cultures make use of their native animals. In this fun and thought-provoking book, Sax argues for a classification of animals that goes beyond the biological to encompass a more meaningful distinction: tradition. From ants and elephants to tigers and tortoises, The Mythical Zoo weaves together a crosscultural tapestry encompassing mythology, history, art, science, philosophy, and literature. The result is a beautifully illustrated, masterfully composed love letter to the animal kingdom. The book was published by Overlook Books and is available for purchase online.